In a new letter to the House Justice Committee, former Liberal cabinet minister Jody Wilson-Raybould says that she will provide additional evidence and a written statement on the SNC-Lavalin affair, even though its probe has concluded. OTTAWA -- In a new letter to the House Justice Committee, former Liberal cabinet minister Jody Wilson-Raybould says that she will provide additional evidence and a written statement on the SNC-Lavalin affair, even though its probe has concluded. “In the course of my testimony there was a request for me to provide further information… Having taken that request under advisement, I will provide copies of messages that I referred to in my testimony,” Wilson-Raybould said in a letter dated Thursday. This additional information will include copies of text messages and emails that she referenced during her four hours of stunning testimony before the committee on Feb. 27. Typically, any formal submissions to House committees are made public. 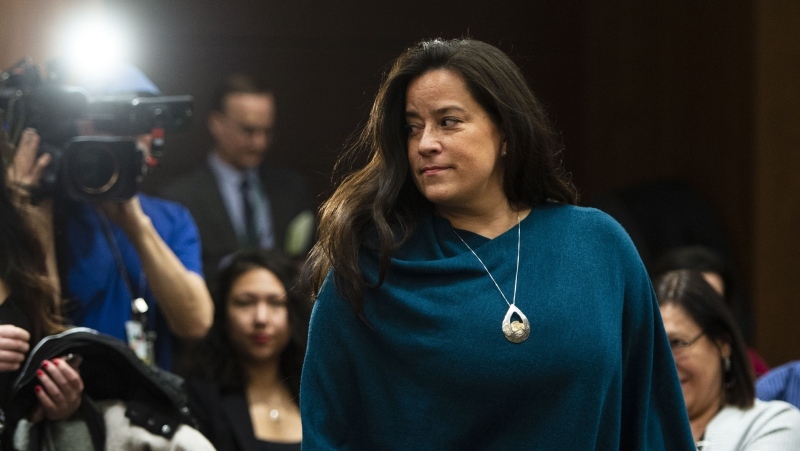 During that appearance, she alleged that she faced high-level “veiled threats” and political interference in the criminal prosecution of SNC-Lavalin. She said she was subjected to a months-long "sustained effort" from nearly a dozen senior government officials to pressure her into doing what she could as then-attorney general to instruct federal prosecutors to drop the criminal prosecution of the Quebec construction and engineering giant and pursue a remediation agreement instead. After hearing a contradicting story from former top Trudeau adviser, and repeat appearances from senior bureaucrats, the Liberal MPs on the House Justice Committee shut down their study of the matter on Tuesday. They said that they’d heard all they needed to and that Canadians can decide for themselves whether they think there was any wrongdoing, something Trudeau continues to deny. “I also have relevant facts and evidence in my possession that further clarify statements I made and elucidate the accuracy and nature of statements by witnesses in testimony that came after my Committee appearance,” Wilson-Raybould wrote in this letter. In an interview on CTV News Channel, committee chair and Liberal MP Anthony Housefather said that just because she will be coming forward with new information, it doesn’t mean they need to reopen the study. He said there have been “many occasions” where committee members complete a study on a topic or a bill and additional submissions are received after the committee is finished hearing from witnesses. “I don’t think the fact that a witness wishes to submit a written submission to the committee means we have to necessarily hold more meetings about the subject but I do think that it’s perfectly logical and appropriate if Ms. Wilson-Raybould feels that she has more to say that she was not able to say in her lengthy appearance before the committee, that she is able to provide that to the committee in writing,” Housefather said. He received her letter on Thursday night, and said that once she does provide the committee with her additional information, it’ll be published on the committee’s website. Philpott, who shortly followed Wilson-Raybould out the cabinet doors, citing a loss of confidence in the way the government is handling the scandal, said in the interview that she believes Prime Minister Justin Trudeau and his top staff have been trying to “shut down” the story. Facing new questions about the letter on Friday, Trudeau doubled down and offered similar comments, saying that Wilson-Raybould has already been able to speak “entirely and completely” about her experience on the SNC-Lavalin file when she was justice minister. “This is something that we have taken very seriously as a government and will continue to take seriously, but there has been a full airing,” Trudeau said. Wilson-Raybould — who over a month ago first stood in the House and implored that she be allowed to “speak my truth” — told the committee that this unprecedented waiver still limited her. “I do hope my response to the Committee’s specific request and the additional information will assist the Committee in completing its study on this important matter and in preparing its final report,” she wrote. Though, it remains unclear whether or not the committee will issue a formal report on this study. Housefather said that so far, the committee has not approved a motion to issue a report. “I think it’s pretty clear when you hear different partisan sides from members on the committee that they’ve reached opposite conclusions, so that the idea that the committee would reach some unanimous report that would tell Canadians definitively what occurred, I doubt it,” Housefather said. The opposition has used several procedural mechanisms to try to push Trudeau to waive all possible confidences, but now Liberal MPs are publicly stating that Wilson-Raybould, and Philpott should she desire, already have all the protection they need: Parliamentary privilege. “I think to clear the air, to everybody’s satisfaction, and for them, is to go on in to the House of Commons,” Liberal MP Judy Sgro told reporters on Thursday. At a town hall in Thunder Bay, Ont., on Friday, Trudeau said the scandal has taught him the importance of “keeping communications flowing properly” between his office and members of the Liberal caucus so that people feel comfortable bringing their concerns forward. The discussions continued “because we didn’t want to see these jobs at risk and potentially lost,” Trudeau added. “There are 10,000 or so Lavalin jobs right across the country…9,000…10,000 in all sorts of different places around the country,” he said. Earlier this week, the chief executive of SNC-Lavalin said that he never cited the potential loss of jobs as a reason to offer the company a deferred prosecution agreement. It is time to “get to the business of governing,” he said, adding that there hasn’t yet been a debate in Parliament over the budget.